Barracuda style roller banner. Excellent value mid range display with high quality print. Full custom printed stoplight roller banner and carry case. 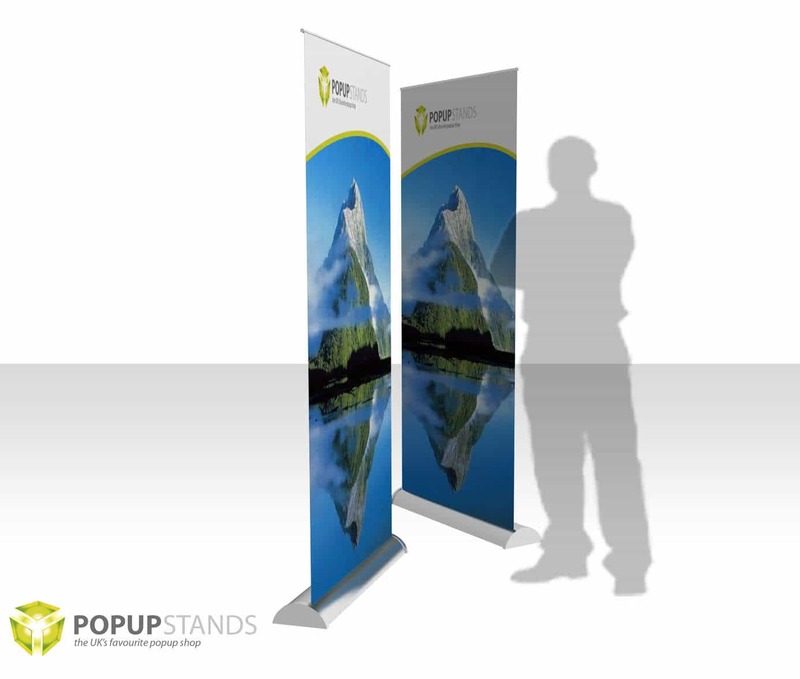 A mid range roller banner unit with quality print. This is a very popular unit for repeat usage and comes complete with canvas carry case and quality printed graphics as standard. The roller mechanism is a stable unit that does not require any feet. Printed on HP fine art printers so the print quality is extremely high. Print is finished with a crystal matt anti scuff surface. As with all of our roller banners this comes complete with high quality HP printed stop-light graphic banner, finished with an anti scuff matt graphics. The following guide will cover all width barracuda style roller banners. Below are various templates for each banner width. There are four different types of template per banner size. Please download one to suit your artwork program. Alternatively use the guide above to create your own artwork file. 800mm width – Artboard size 800(w)x2230(h) 100mm bleed at bottom is not seen. 850mm width – Artboard size 850(w)x2230(h) 100mm bleed at bottom is not seen. 1000mm width – Artboard size 1000(w)x2230(h) 100mm bleed at bottom is not seen. 1200mm width – Artboard size 1200(w)x2230(h) 100mm bleed at bottom is not seen. If you require assistance with artwork please call us on 0845 604 4414. Great little pop up, feels like good quality. Printing is good. The colours look bright and the print is smooth. Arrived a day later than expected but not an issue. Super stand, very happy with this purchase. Delivered quickly, banner is fine, not much more to say. Perfect banner for our booth. The size is a little taller than expected but it does look great. The print quality is good, the colours match our logo pretty well. Nice metal cartridge unit with a sturdy base. Brilliant stand, our first exhibition is coming up and this is perfect for us. Thanks so much for the really quick delivery! Asked to leave a review here for this purchase. Roller banner arrived quickly, boxed well and comes in a black carry bag case. The banner is printed well with the usual pole on elastic. Seems like a good quality metal case it retracts into. Will use again when needed. Need your roller banner designed? We have a team of graphic designers who will design your banner for you at a fixed cost for each design. Our team of designers are working on exhibition stand design everyday. All they require from you is a short brief detailing what you would like and any wording or logos to use. Then leave it to us to come up with your next roller banner, designed to make people stop and look at your branding. Jump the queue. Use our express printing service, we'll dispatch your display the next working day from receiving your print ready artwork.